SANKHU, Nov 22: After waiting for almost two years after his house was destroyed by the earthquake, Krishna Charan Shrestha of Sankhu in Shankharapur Municipality started rebuilding his house. As he finally started working on the foundation of his new house, the only worry Shrestha now has is whether he will receive the housing grant from the government. "I waited for almost two years for the government's housing assistance. But the assistance did not come, so I decided to build the house on my own by taking loan from relatives and others," said Shrestha, who was busy at the construction site on Monday. "I do not want my family to spend another winter in temporary shelter. But I am worried if I will receive the housing grant from the government." 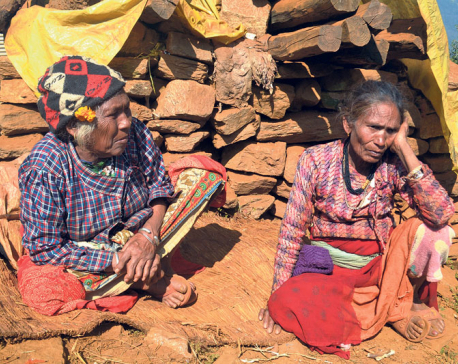 Shrestha is among many earthquake victims in the Sankhu area who have started rebuilding their houses even as they are yet to receive the first installment of the housing grants. Taking loans from his relatives, Surya Ranjit has also started constructing a new house. "But as the government did not distribute the grant amount even two years after the disaster, I could not wait any longer and decided to build the house," he said while he oversaw construction works of his house. After the last year's earthquake completely destroyed his five-storey building, his six-member family has been living in a temporary shelter. In Sankhu area, most of the quake victims can be seen constructing new houses lately though the National Reconstruction Authority (NRA) is yet to begin the grant distribution. Some of them have already completed their new houses. All of them said that they were tired of waiting for the government to provide the grant amount and they have started construction of new houses. However, now they are even more worried to learn that the government may not provide them the grant if the houses construction fails to meet the construction criteria set by the government to be eligible for the grant amount of Rs 300,000. As per the grant distribution directives issued by the NRA, those victims who have already constructed their houses should make sure that their houses meet the construction criteria set by the NRA if they are to qualify for the grant amount of Rs 300,000. 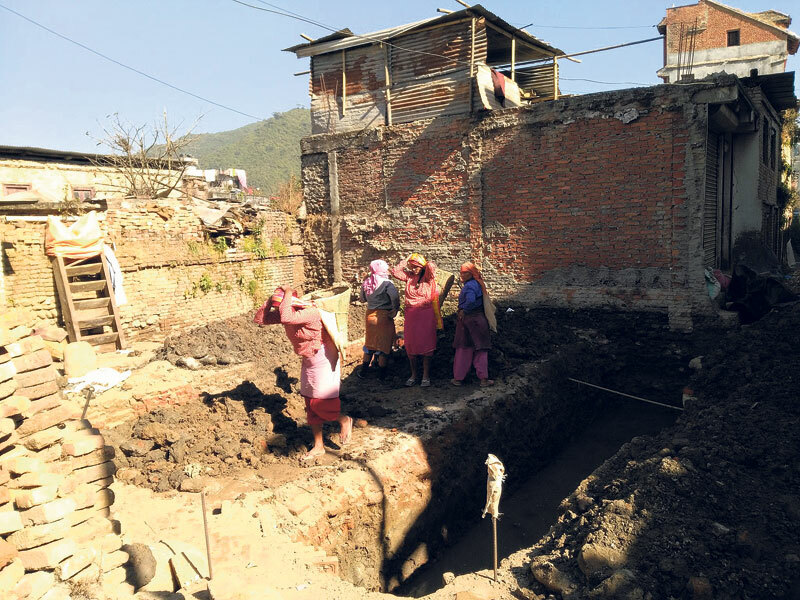 Since the NRA has not deployed its engineers to Sankhu area to oversee the house construction work, the victims are worried about the prospect of their houses not meeting the NRA criteria and becoming ineligible for the grant. "Though Rs 300,000 is not enough to construct a new house, the money still matters as we can use the money to pay our loans. But since there is no monitoring mechanism to see if our houses are being constructed in line with the criteria, we are worried that we may not get the grant," Shrestha said. His name is in the list of the victims eligible for the grant amount. According to Shankharapur Municipality office, 5,198 victims have been identified as eligible but majority of them have already started rebuilding their houses on their own. Acting chief of the municipality, Kapil Prasad Poudel also said that many quake victims whose houses were completely damaged by the last year earthquakes have started rebuilding their houses on their own. "Chances are high that the victims may not get the grant amount if the construction work is not monitored. And most importantly, the houses they are rebuilding may not be earthquake resilient though the theme of the reconstruction is build back better," he warned. 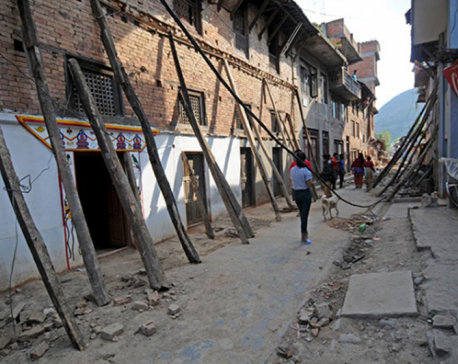 The report 'Nepal Earthquake 2015: Building Resilience, Rebuilding Lives' by Humanitarian Accountability Monitoring Initiative, a consortium of various civil society organizations, had also highlighted that there is poor coordination between the government and the local communities in the overall task of reconstruction and rehabilitation. It has also said that the poor coordination may continue to put the victims at risk. According to the municipality office, last month alone, as many as 93 quake victims were found constructing houses without having their building blueprints approved from the municipality. He said that the government must deploy engineers to oversee the construction process as soon as possible.